WGH, DC, Ram Singh speaks during Under 16 Football Tournament held as part of observing RKSK. ST photo. TURA: West Garo Hills Deputy Commissioner, Ram Singh on Monday attributed diseases like hypertension, diabetes, obesity, liver and heart diseases etc. to sedentary lives, lack of physical activities and unhealthy food habits people are accustomed to in the modern and contemporary times. 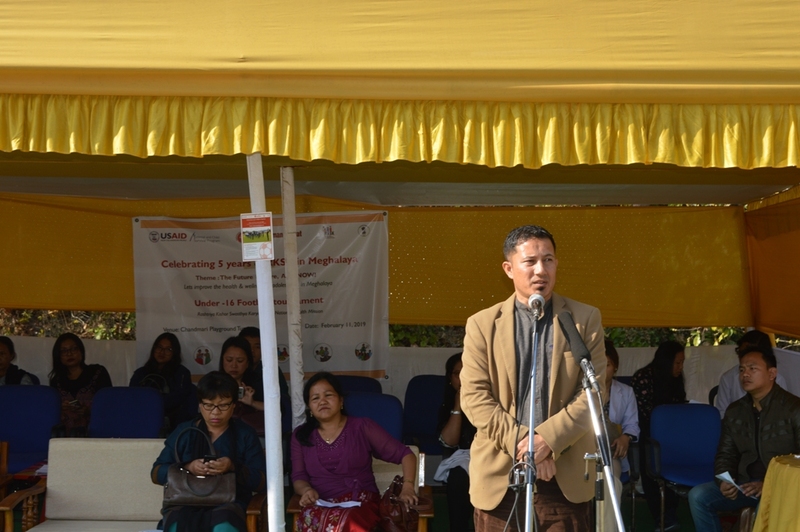 He said this while participating as the Chief Guest in Rashtriya Kishor Swastha Karyakaram (RKSK), organized by the District Medical & Health Officer, West Garo Hills, Tura, to mark the completion of five years of RKSK in the state at Chandmari playground. Stressing on the need for a disciplined and healthy life habits, the Deputy Commissioner said owning umpteen fleets of vehicles doesn’t necessarily add to one’s status in the society; but it is the quality and simplicity in terms moral and values that matters the most. Lauding the efforts of the medical department, he said that because of the sustain and aggressive health camps conducted by them in the schools particularly in the rural primary schools in the recent past, many diseases that afflicts the children that were retarding their growths, have come to the fore, enabling the health officials to take preventive measures against the diseases. The Deputy Commissioner urged the health department to conduct counselling camps for the urban youth who face many challenges like peer pressure, anxiety and stress due to examinations and many other adolescents’ related issues. Earlier giving the key note address, District Maternity & Child Officer, Dr (Mrs) Ivonne M Sangma informed that India has about 253 million adolescents today who have the potentials to transform the socio-economic profiles of the country if substantial amounts are invested in the development of their education and health care systems. Therefore, realising this and in order to ensure holistic developments of the adolescent population of the nation, the Ministry of Health & Family Welfare, Government of India, launched this RKSK programme on 7th of January, 2014, to reach out to these bubbling youths with an objective to promote healthy lifestyle, violence free living, improve nutritional status, prevent substance misuse (drug abuse), including sexual and unwanted pregnancies, prevention of gender biased violence besides emotional developments. As part of the programme, besides painting and art competitions, free health checkups were also conducted for both adolescents and the adults in which some 100 adolescents were found to be suffering from moderate anaemia while some 15 adults all above the 30 years of age, were found to be suffering from hypertension. Two others were detected as having symptoms of diabetes.